If you thought it would be tricky to gain a position of power in Halloween Town, think again. Sure, Jack Skellington used his spooky prowess to win the title of Pumpkin King over and over again. It may also have had something to do with timing and wit, mostly, though, it had to do with looks. 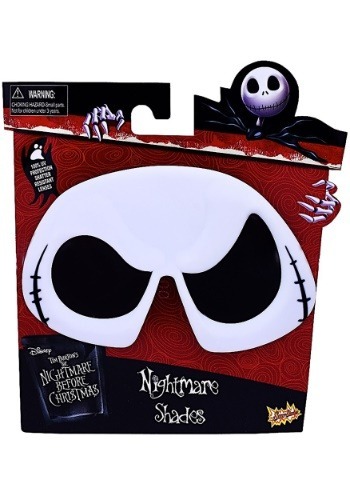 With these glasses, you can put Jack's debonair eyes over your own. Some people might think you're a bonehead for running for Pumpkin King but you know that becoming a bonehead is kind of the point. These sunglasses are the easiest way to see the world through Jack's eyes. With his instantly recognizable eyebrow lift, you'll have Santas everywhere shaking in their fur lined boots. These sunglasses are UV protected so Jack take in the summertime sun. Who knows, he might end up taking over the 4th of July next, he's a pretty ambitious guy. So when Jack's making his summer debut be cautious if, when he takes a bite of ice cream, he sings, "What's this? What's this?"